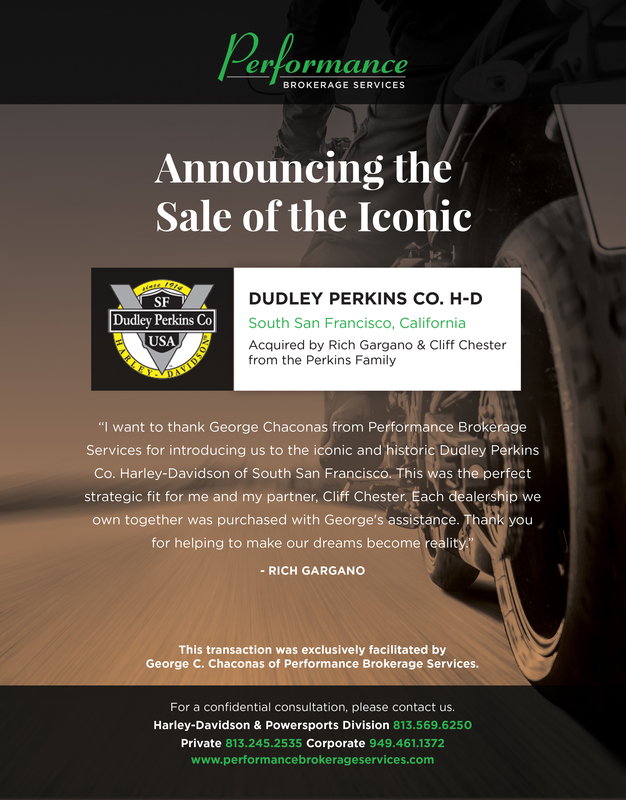 Performance Brokerage Services, a new car and Harley-Davidson dealership broker is pleased to announce the sale of Dudley Perkins Co. Harley-Davidson in South San Francisco, California from Janet Perkins to Rich Gargano and Cliff Chester. Dudley Perkins Co. Harley-Davidson is the world’s longest running family owned Harley-Davidson dealership. The dealership was established in 1914 by Mr. Dudley Perkins, Sr. in San Francisco and remained in the family ever since. The business also operates Harley-Davidson of San Francisco, an alternate retail outlet on the famous Fisherman’s Wharf.